Foy Update: Which Exotic Cuisine Would You Cook? Which Exotic Cuisine Would You Cook? The next Project Food Blog challenge is to tackle a classic dish from another culture. I'm bypassing the French and Italian standards in favor of more challenging cuisines. I went down to the library and found several regional cookbooks that are completely out of my comfort zone. Which of these would you like to see me take on? A. South African - I have a friend that visited South Africa for her graduate work and she made a South African peanut soup to bring to a potluck, but it spilled in the car and I never got to try it. I picked up the Complete South African Cookbook. Although, I might need to supplement it with a cookbook that has more about the cultural context because this book is mostly recipes. There has to be more to South Africa than the annoying vuvuzela. B. Iraq - When I think of the Middle East, I think of conflict and war, talk about out of my comfort zone. But in the Cradle of Civilization there must be depth and richness to their food as well as their history. It would be fun to discover another side to Iraq. 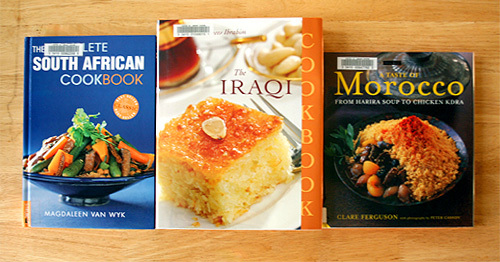 I checked out The Iraqi Cookbook which has stunning photos of artfully arranged food in golden light. I also like that this cookbook is geared for the American cook and kitchen. C. Morocco - On all the cooking shows, like Master Chef, Moroccan food comes up as this spicy, exotic, amazing food. I know pretty much nothing about this cuisine. The Taste of Morocco from Harira Soup to Chicken Kdra cookbook that I found has beautiful photos of fresh vegetables, lamb and pastries. I like that the book has a glossary of ingredients including substitutions, because I know it will be hard to find za'atar in rural Midwest America. It's excellent to know thyme, marjoram, oregano with a pinch of pepper is a viable alternative. What do you think? Which should I choose? Which would you choose? Go over to the right hand column and vote! I'll leave the polls open for three days. Results are in check out this post to see which cuisine I'm cooking! Hi! I want to see you cook Iraqi. I don't know anything about the cuisine of Iraq so I'd love to see what you come up with. Good luck on making it to the next round! I'm following you now. I think we are friends on Foodbuzz but I hadn't made it over to your blog yet. I'm so glad I did. It's a very diverse cuisine with unique flavours and ingredient. The slow-cooked stews waiting overnight with the flavours wafting up the stairs. then there's the baking.. whoa.. your head will explode. More flavours. Wonderful. Great Idea !! you are on the right track to winning and to incorporate your readers to the next step of the contest, brilliant. PS voted Moroccan. I love it. I'm thinking Iraqi as well. It seems that we hear so much negativity about Iraq. It would be nice to learn more about the Iraqi culture and people. I love preparing Moroccan and think it's more well known than Iraqi cuisine so I vote Iraqi! Would love to see what you come up with if you advance to next round! I think I'd vote for Iraqi. I agree with Gayle, there is so much negativity surrounding this amazing, beautiful and ancient culture. Food always breaks down barriers and brings us together, and I think it would be awesome! Good luck! Moroccan or Iraqi. I'd be happy to see either. Always cool to learn new dishes from far off lands. Any of these would be tasty. South Africa has the advantage of having very diverse cooking--it has sizable ethnic Indian, Malaysian, English, and Afrikaans populations, all of whom bring unique flavors and recipes into the mix. As an added bonus, there is a lot of squash in the recipes, so it is a good match for the season! I can contribute recipes if you want. I think they all sound wonderful, but voted for Moroccan because I'm in the mood to make something Moroccan as well! 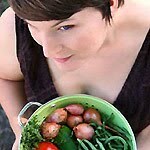 I was looking at http://mykitchenmyworld.blogspot.com/ and thinking about participating. Oh, I think S. African... it is the cuisine I can't already imagine. Iraqi sounds like a challenge! I vote for South African. Everything I ate there was fabulous. I considered it myself if I should advance, but I'm going Brazilian, which I like even better! I vote for South African, too. I've seen lots of Moroccan foods in blogs but South African (or any sub-Saharan African) recipes are rare to find. this had me giggling, as being South African, I don't consider our cuisine exotic. If you do want to try South African cuisine pop me an email (you will find my details on my blog site) and yes, even there is more to our beautiful country other than the vuvuzela :) Good luck! I voted for Iraqi, for many of the reasons others already stated, but also because I know virtually nothing about it either. Good luck! I vote for Iraqi because I'm curious to see what type of dishes it includes. Best of luck. My vote is for Moroccan! I voted for Moroccan - sounds delicious! I wish my local library had more exotic cuisine cookbooks - I found French, Italian and Irish. That was pretty much it. I've been pretty obsessed with Indian cuisine lately. If I were a contestant, I'd probably go with that. So I guess that's why I'd like to see you try the Moroccan cuisine because it can be spicy and highly seasoned. I'm very excited to be a spectator for this challenge. We should be treated to a lot of great recipes! I vote Iraqi, cant wait to see what you make. I'd go for South African. One of my favorite meals is from South Africa and I think of it far too often. 2nd would be iraq. Either way, I'm craving some international food right now. I also vote for Iraq - The war and conflict is for politicians and those who crave power. Food is a way to understand a culture that simply craves peace and freedom. No matter who we are, we do our best to join our family of blood and choice together during meal time. Iraq - the food of the Middle East is some of the most delicious, but the hospitality makes even the humblest dish taste fantastic. There is more to the Middle East than hummous - break the stereotypes. My 2 penn'orth! British Expat in the Middle East with Iraqi neighbours. I have made some semi-Moroccan dishes and I like the bright, spicy flavors. We have many varied cuisines within what is labelled 'South African', the likes of which include 'Boere Kos' (farmer's food), Cape Malay (indian influenced) and then of course the various african varieties. All good in their own right. I would recommend Moroccan food! Amazing cuisine. I vote Moroccan, one of my best friends went there this past year and cooked me some and I loved it! Foy Update is on Facebook! Like it?